It’s time to tick Tassie off your bucket list! On this Tasmanian guided holiday you’ll experience what the island state is world renowned for - idyllic scenery, abundant wildlife and friendly locals. Journey to Mt. Field National Park to witness the stunning natural beauty of Russell Falls then journey further to the Gordon River, Cradle Mountain, Freycinet National Park and Port Arthur. Tantalise your taste buds along the way, sampling local cheeses and other delicious treats. This holiday is ideal for those wanting a real taste of Tasmania. Itinerary1 September 2015 - 31 August 2016 ? Transfer from Hobart Airport to your hotel for check-in and then you’ll take an afternoon tour of Hobart. Your orientation takes in Battery Point, Salamanca Place, the Botanic Gardens, Constitution Dock, and Mt. Nelson for amazing views overlooking Hobart. 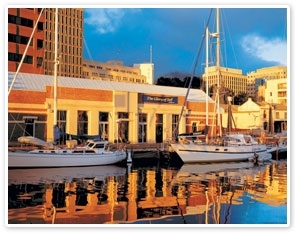 Tonight you will meet your Tour Director and fellow travellers for a welcome dinner with fabulous views of Hobart. This morning you head west to New Norfolk and the magnificent Mt. Field National Park. Tasmania’s oldest National Park is the location of the spectacular three-tiered waterfall, Russell Falls, which is surrounded by towering swamp gums. You’ll then take the winding journey to Queenstown, along the rainforest bordered road of World Heritage protected Franklin-Gordon Wild Rivers National Park – a magnificent part of the world. Today you travel to the fishing village of Strahan on Macquarie Harbour where you’ll cruise the Gordon River, while enjoying lunch. You’ll be awestruck by the beauty of the dark waters, reflecting the untouched wilderness and be amazed by the 2,000 year old Huon Pine at Heritage Landing. Later, the afternoon is yours to relax and enjoy your surroundings. Hotel: West Coaster Motel, Queenstown, 2 nights. Travel past Lake Plimsoll through Tullah on the shores of Lake Rosebery, surrounded by forests and mountains to the sensational Cradle Mountain National Park. Once there we’ll take you to gorgeous Dove Lake for spectacular views of Cradle Mountain – make sure the camera’s charged, this is a scenic highlight, and the air – there’s none fresher! Rolling green hills and Friesian cows – this afternoon you’ll think you’re in a butter commercial as you make your way past Table Cape, home of tulips, for views of Bass Strait, the lighthouse and coastline. You’ll then visit Highfield Historic Site, unique among colonial residences in Tasmania. It was built by the Van Diemen’s Land Company and is a rare example of domestic architecture from the Regency period, which is characterised by refined decoration that is geometric yet elegant. Your final destination is Smithton. Picturesque Stanley is in your sights as you head west with a view of ‘the Nut’. Next stop is Burnie for a guided tour of the Makers’ Workshop, a place that honours Burnie’s history, innovators and artists. Later, travel east along the coast through Penguin and Ulverstone then south to Sheffield for a wander through this town of murals with its colourful wall paintings that adorn the town’s buildings. En route to Launceston you’ll visit the Ashgrove Farm Cheese Factory for a presentation on cheese making and some delicious produce testing – yum! Start your day in the Tamar Valley at Tamar River Winery, where a local wine expert will treat you to a comprehensive private wine tasting. This afternoon is free to explore ‘Lonny’. Maybe visit Cataract Gorge or take a cruise on the Tamar River. Hotel: Best Western Plus Launceston, 2 nights. Your first stop is Bridestowe Lavender Estate. Why not try one of their famous lavender ice creams! Later you’ll see Legerwood Carved Memorial Trees in honour of fallen WWI soldiers, and then drive through the lush myrtle rainforest at Weldborough Pass. You’ll visit St. Helens before arriving in the seaside hamlet of Bicheno. At dusk head out to discover Bicheno's little Blue Penguins as they come to shore. Get your camera ready for the spectacular and breathtaking – Freycinet National Park. You’ll take a walk that will unveil astonishing views across brilliant blue water, forest and golden beach. Cape Tourville Lookout is awesome! Travel through Swansea and Orford, then chart a course for Port Arthur along an impressive cliff-lined coast. You’ll cross the 100 year old Denison Canal and the historic once-guarded checkpoint of Eaglehawk Neck. On arrival in Port Arthur, you’ll cruise around the Isle of the Dead and then take a guided walk of the Historic Site and prison. This evening, perhaps test your nerve on an optional lantern-lit Ghost Tour of Port Arthur. Hotel: Port Arthur Motor Inn, Port Arthur. This morning, on your way back to Hobart, feast your eyes on the amazing vistas of Tasman’s Arch, Devil’s Kitchen and the Blowhole. Next stop at Sorell Fruit Farm for a chance to taste a range of products made from fruit grown on the property, and even take the opportunity to pick some fruit yourself! Drive through the Coal River Valley to the historic sandstone village of Richmond, site of Australia’s oldest operational road bridge and a perfect spot for lunch. Cross the Derwent River on your way into Hobart, where the afternoon is free to do as you wish. This evening join your Tour Director and new-found friends for dinner. Your holiday concludes this morning after breakfast. You will be transferred to Hobart Airport for your onward flight. Note: This itinerary is valid for departures after 1 September 2015. Book another night or a flight after 8pm and discover stunning Bruny Island or visit fascinating MONA. For the last 25 years, the pictorial history of the region has been painted on almost every blank wall throughout Sheffield! How did it come about you ask? In 1985 a public meeting was held to formulate strategies to overcome the economic decline in the region and a committee was formed, now known as Sheffield Inc. It began investigating an idea that had been successful in a town in Québec, Canada that had been faced with a similar decline. The rest is history! Any flights referred to in the itinerary are at the client’s expense and are not included in the land content price.